Freddie Hunt's first real spin in his father's 1975 Hesketh 308 F1 car at Goodwood and what's it like to drive for "Ferrari". 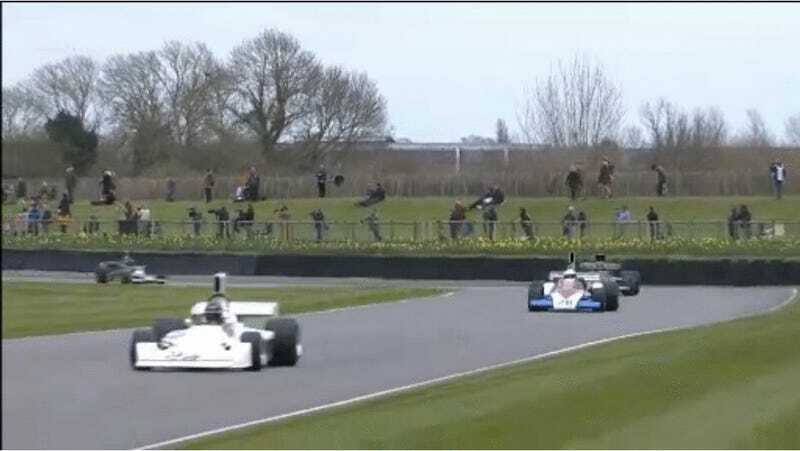 The 73rd Members' Meeting at Goodwood saw a young Freddie Hunt taking James Hunt's car around the legendary circuit, surrounded by other cars from the era, firing away in spectacular fashion. When I scheduled the interview with the young man, though, I didn't have a clue he would be turning up racing at the prestigious event. Nor did I, haha! It's happened pretty much the same way every other time I had driven that car, which is I had gone to the meeting just as a spectator, more for - well - networking and I see dad's car over there, so I ask the owner "Hey, do you mind if I drive?" and they said "Yeah, no problem." So I was really lucky, it was a really nice surprise. And finally I had the opportunity to drive it properly to make the tyres work, because the previous times it was two demonstration laps behind the safety car or so, but this time I had seven or eight laps, tyres warm. And they said - obviously - "Take it really easy." It's funny, because the owner of the car wasn't there, he was doing business. So the guy driving the car rings him up and says "Do you mind if Freddie drives it?" and he goes "Yeah, yeah, no problem, but for Christ's sake, make sure he's careful." and he rang back half an hour later and said "FOR CHRIST'S SAKE, MAKE SURE HE'S CAREFUL! ", haha! Obviously, I didn't want to crash the car - for my health, my wallet and my reputation. But when we started from the pit lane in five-second intervals, I was taking it easy in the first two or three laps and I started feeling more comfortable and confident, so I... not pushed, but kept going quicker and quicker and I found myself in the lead. My lap time was 1:15 and apparently - considering I didn't know the car or the circuit - it was quite a respectable time. I had driven on the Goodwood circuit before, though, but it was like three parade laps. Obviously, one does not simply make a career out of one-off vintage car races, Hunt is set to have a regular seat in tin tops, driving the BKR car in the British Renault Clio Cup. I was introduced to Nico by a friend, that is Nico Ferrari, the team boss - it's a cool name, isn't it - and he invited me for a test. It went really good and they got a sponsor who were willing to cover the first two rounds, so they invited me to race and hopefully I will be able to drive a few more rounds later in the season but we need to find the money first. I can't make it to rounds three, four and five because of the Formula E meetings, so we are looking for budget from the sixth onwards. Freddie Hunt is taking the charge to Formula E, but not the way you might be expecting it. As reported earlier, Hunt is very much keen on racing at Le Mans, and on the shorter term he is set to race at the Britcar 24 Hours race, taming a Jaguar at Silverstone and seeking other endurance ventures. The Britcar 24 hours is only a month away, so I'm hoping to do some tests soon and I'm really looking forward to it - my first proper endurance race - and I'm confident that as long as the car can last the distance we should be having a good result. My goal is still very much sports cars and GT cars, but if e.g. somebody invited me to drive touring cars, I'd take that opportunity. At the moment I'd take pretty much anything. For example a rallycross team got in touch with me and invited me for a test, so why not? It's free driving. I wouldn't have thought it would be a career path for me, but there's no harm taking a free test. But the goal is still Le Mans and I've been in conversation with an LMP3 team who are launching their program the next season, but hopefully they want to get all the budget in place with the documentary and crowdfunding as well. Hopefully the budget will round up in September so I can have a good winter testing programme, so we can take on ELMS and maybe Le Mans next year. It's a lot of money to find but they seem like a good, professional outfit, also their strategy seems pretty good. As for single-seaters, I'm not looking for a budget there, but recently an Australian F3 team e-mailed me to invite me to drive for them. For a final thought, a little taste of what's it like scrambling for budget in an economically challenged world - for sure it's never enough to have a familiar last name. We got some great opportunities with potential sponsors and at the moment we are trying to figure out how to get a good return for them, they are interested in making direct business throughout our contacts that we introduced to them, so we are trying to put the two together. Fingers crossed to have a deal and get a sponsor for the rest of the season.